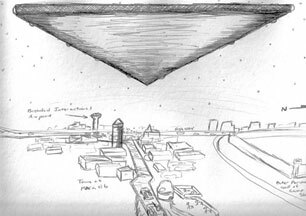 Part 1: Gigantic, Silent, Black Triangle Above U. S. Army Platoon in Baghdad — Same Day Pres. George W. Bush Made Surprise Visit. Eyewitness U. S. Army Sergeant 1st Class David Mark Koch (Ret.) estimated aerial triangle above Makasib, Iraq, was 1200 feet long and remained unmoving in the night sky for at least five minutes. Illustration © 2014 for Earthfiles.com by David Mark Koch. October 31, 2014 Baldwin City, Kansas - On June 13, 2006, U. S. Army Sergeant 1st Class David Mark Koch from Kansas was Charlie Company Platoon Leader in the 2nd Combined Arms Battalion 137th Infantry Regiment, working at the Radwaniyah Palace south of Baghdad. That grand palace belonged to Saddam Hussein until it was taken over by coalition forces during the March to April 2003 invasion of Iraq ordered by U. S. President George W. Bush. Next PostNext Part 2: Why Do World Governments Conspire to Conceal UFOs and E.T.s?